Anticipation for Insomniac Games’ Spider-Man is building steadily and I keep speaking with friends and co-workers about it, filling in my non-comic book inclined acquaintances that keep asking me about the new face in the available footage. Most comic book fans have a bad association to the titles One More Day and Brand New Day, but there are some aspects of that time period that were refreshing for one of Marvel’s long-running characters. My favorite part was the introduction of a new villain with an interesting look. I know Mr. Negative may still be new to some readers, and downright unknown to those who are only aware of Peter Parker and his alter ego through the movies or games, so let’s talk about why he is going to fit in with the rest of the heroes and villains occupying New York quite nicely. Saddened by the news that he wasn’t going to be the main villain, I realized that Mr. Negative would make a solid introductory foe for this entry, in hopes that he’ll leave a lasting impression and headline next time. I wish I still owned the issue that has his debut from Free Comic Book Day 2007, a Spider-Man issue called Swing Shift, while his first full appearance was in The Amazing Spider-Man #546 at the beginning of 2008, as the web-head’s world had been completely changed. It wasn’t the best time for our hero to most readers, but was the perfect opportunity to introduce new enemies. Mr. Negative was created by Dan Slot—who has done a lot for the web-slinger in the past few years—and Phil Jimenez, as a more classic underworld type villain similar to the Kingpin, but with an interesting take on his past, powers, and motivations. The criminal boss hides in plain sight under his alter ego, Martin Li, behind a humanitarian outreach project known as F.E.A.S.T. (Food, Emergency Aid, Shelter and Training), where people get assistance and some lucky visitors are even healed miraculously. Even Peter’s aunt, May Parker, volunteers at the shelter because it does such good for people in need. This is exactly why it makes sense that Spider-Man is so surprised to see him in the E3 footage, and then realize that Martin Li is in fact Mr. Negative. That is a big deal, something that hasn’t even happened in the comics to date, as the few that know the man’s true identity are also villains themselves. This will hopefully be a big event in the overall story of the game, even if they don’t take the time to go much more in-depth. In case they don’t, let me fill in some of those gaps. Not all of the exact details to the character have been revealed by Marvel, but readers know that Martin Li and Mr. Negative share the same body, but are not the same individual, as Negative seems to be aware of Li, but not the other way around until much later. The body that houses these two personalities is a former smuggler and member of the Snakehead gang, whose name is still unknown, but was traveling as a guard on the ship that the real Martin Li and others were being transported in until it crashed in New York. Taking the identity of his human trafficking victim, he had the displeasure of being captured by the Maggia crime syndicate, specifically those who answered to Silvermane, another old Spider-Man nemesis. The man now impersonating Li was handed over to Simon Marshall, a scientist doing experiments with a new designer drug, D-Lite, that somehow gave him—as well as heroes Cloak and Dagger—powers based off of the Lightforce and Darkforce. The drug is so powerful because it was actually made by a demon, but that might be getting too far down the comic rabbit hole. With Martin Li’s identity and Negative’s newfound abilities, it was easy to begin a secret criminal empire and having multiple gangs under his control, while his alter ego lived out the American dream of going from immigrant to wealthy businessman. These elements create a duality for a solid motivated monster, and his plans to destroy the Maggia and rule New York’s underworld means he often has to tangle with Spider-Man. Fighting Mr. Negative is no easy task, as he isn’t just a cool looking scary face. As Martin Li he uses the Lightforce to heal people and make them stronger, with the prime example of this being Eddie Brock, who was cured of his cancer and became Anti Venom—another side story. The footage shows him in his photographic negative form shooting powerful blasts at our hero, while he has exhibited enhanced strength and defenses in the comics, but those are really just the basics. Objects held by this powerful enemy can be imbued with a negative focus, giving them more strength and durability, as he often uses daggers and swords. He can also do this to a person, giving them these same enhancements, and making these slaves serve him as they shout his praises. Mr. Negative is a corruptor, in many ways, and the more good the corrupted individual was, the worse their corruption manifests, making them more sinister and potentially stronger than a less righteous person would receive. Players will need to take on his personal guards as well, his Inner Demons. The suits and masks are just for extra intimidation, as they are skilled fighters with high-tech empowered weaponry and are almost impossible to kill. If that wasn’t enough, Mr. Negative has also worked with other underworld villains like Hammerhead and Spot when he needs to bring in a bit more power. Mr. Negative will make an impact in this game—he already has with that E3 footage—no matter how big or small his role is. My only hope is that since the game is letting Parker find out his secret identity, maybe they will unravel even more of the mystery for fans if Marvel is willing. The banter between the two should be fun, even though Mr. Negative doesn’t retort as much, they could drop some story bits here as well as some good memorable dialogue. This is technically not his first appearance in a game, but his other spots are more like mentions and cameos. 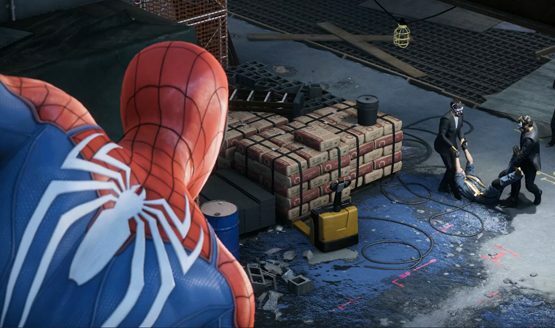 In Edge of Time there are Daily Bugle news articles about Martin Li, while the Amazing Spider-Man game has him leaving his signature next to a F.E.A.S.T. shelter as well as other places, and Amazing Spider-Man 2 goes as far as having Shocker reference Negative’s crew being afraid of Cletus Kasady. Now is the time for him to shine; or be exposed, I guess. Jokes aside though, he’s an interesting character that will be good for the game, and a new set of fans will certainly know his name.